Since 1928, we have been helping companies strengthen their image and professionalism with uniform rental programs customized to fit exact workplace needs. Iron City’s uniform rental programs eliminate the hassles of purchasing, laundering, and repairing your personal garments – saving you time and money – while keeping your employees safe. 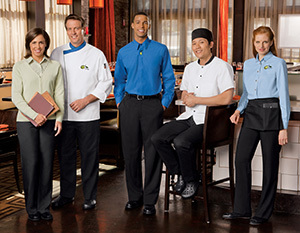 We guarantee that your employees will look and feel professional every day with an Iron City Uniform Rental Program! In addition to our 85 years of caring, personable, family-owned service, our main competitive advantage is our investment in new and innovative RFID Smart Chip Technology. With RFID Smart Chip Technology, each individual dirty garment is scanned into our facility immediately once our truck returns, and after our professional laundering and automatic RFID sorting process, each clean garment is then scanned out of our facility before the delivery day begins. This ensures 100% Accuracy and Accountability in our services, as well as complete transparency through our Personalized Customer Portal on our website where you can view any weekly invoice and delivery report.